This recipe requires quotation marks because it contains no potato skins and isn’t really a pasty. That being said, it’s delicious, and the perfect thing on a cold autumn night. The filling is inspired by the classic American potato skin: potato, cheese, green onions and bacon. Some add sour cream, and if you want to get technical, the crust has sour cream in it, so the ingredients are all there. What results is a savory gooey mess inside of a flaky pastry. The reason this isn’t a proper Cornish Pasty is that pasty crust is harder and drier, designed to last a morning in a miner’s pocket and then be eaten out of the miner’s hands. You could eat these with your hands, but the crust is so buttery that your fingers will get all greased up. I don’t necessarily have a problem with that – butter makes a decent moisturizer – but it might offend those with daintier sensibilities. I used this pastry recipe from Smitten Kitchen, Zucchini and Ricotta Galette, which has recently become one of my favorite pie crusts. Once you’ve made the crust, you’ll need 1 lb slightly-waxy potatoes. (I used “Maris Piper” potatoes, which have a similar texture to Yukon Gold.) Peel-em, chunk-em, boil-em and mash-em with a splash of milk and a bit of butter. No need to mash them super well: you want some chunks in there. Cook and crumble 3 pieces of un-smoked back bacon. 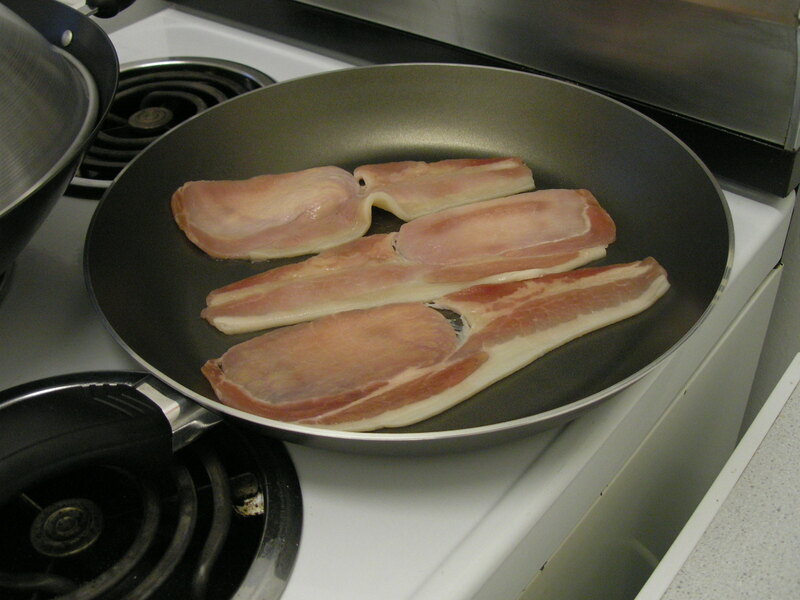 Were I Stateside, I’d probably use 4 slices of regular bacon, but I’ve come to really enjoy the flavor of this stuff. With less fat, it tastes more like a pork chop, a very salty pork chop. Then mix it all together and try not to eat it right away. Waiting proves that you can handle deferred gratification and will be a successful adult, at least according to Mischel’s marshmallow experiment. For those not familiar, young kids were tested on whether they could resist eating a marshmallow right away, knowing that it would earn them two marshmallows later on. This resulted in some fascinating research and hilarious videos. I always identified with the kid who licks the marshmallow, but doesn’t technically eat it; it’s all about the letter of the law. However, you probably don’t want to lick the potatoes and then serve them to company. Roll out the pastry in roughly 9-inch circles. Put a hunk of filling on one side. Fold over the crust and roll up the edge to seal. Lay it on a lined baking sheet and glaze with egg. Yes, this is a tiny baking sheet; I have a teeny-tiny oven. Bake at 400° F / 200° C for about 35 minutes or until golden brown. While the pasties are baking, you even have time to make a guilt-reducing salad. Given the lack of potato skins and the non-pasty-crust, this should be technically be called a potato-scallion-bacon-cheese hand pie. 2. Drop potatoes in a boiling pot of salted water and cook until fork tender, 10-15 minutes. 3. While potatoes are cooking, prep the bacon, cheese and green onions. 4. Drain potatoes and reserve the cooking liquid. 5. Roughly mash potatoes with butter and milk, leaving some chunks. 6. Add bacon, cheese, green onions, salt and pepper to the mixture and stir to combine. Also add some of the cooking liquid if the mixture seems too dry. 7. Divide pastry into six sections and roll each into a 9-inch circle. 8. On one side of each pastry circle, put 1/6 of the potato mixture, leaving a gap around the edge of the circle. Fold over the crust and roll up the edges to seal. 9. Place pasties on a lined baking sheet and brush with beaten egg. 10. Bake in preheated oven for 35 minutes or until golden brown on the top and bottom. 11. Remove to cool for about 10 minutes and serve.